If you are a child of the 80’s, you know what 1987 Topps is. It was absolutely loaded with key rookies, but it was produced in such high numbers, I probably don’t have enough space here to write out all of the zeroes. 36 packs of wood bordered glory that hasn’t seen the light of day in thirty one years. The man behind the box? That’s dad. This man, along with my mom, faithfully took me to baseball card shops every weekend for years. The first time they took me was with their friend’s son in 1987. I had NO idea about baseball cards at the time, but I was game. My parent’s friend’s son bought a pack of 1987 Topps and I asked if I could get one also. Sure enough, mom & dad let me have one. 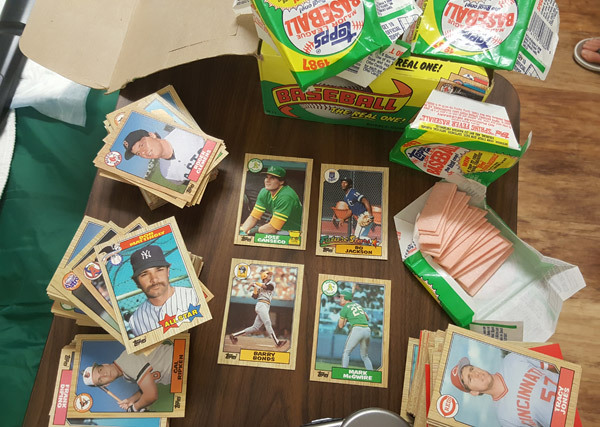 The first one has an embedded wax wrapper and gum from a pack of 1987 Topps. It is “slabbed” in a one touch and sealed with more wax pack wrapping. The middle is a Simpsons version of the card I came up with and last but not least, is a custom made completely out of wood. It just makes sense to have the wood bordered card made out of … well … wood! 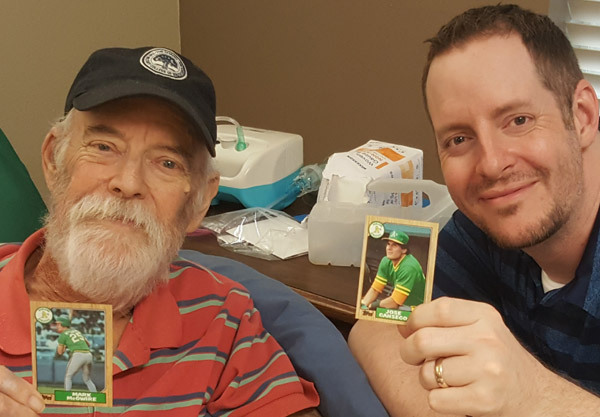 I wanted to bring some joy to dad, and, well … let’s face it: Baseball cards are my love language. My wife, son, mom and dad all got to ripping. First, with the ritual of scratching the pack under the hat brim three times (something we did when I was much younger.) It was great being able to tell everyone what cards to look for. 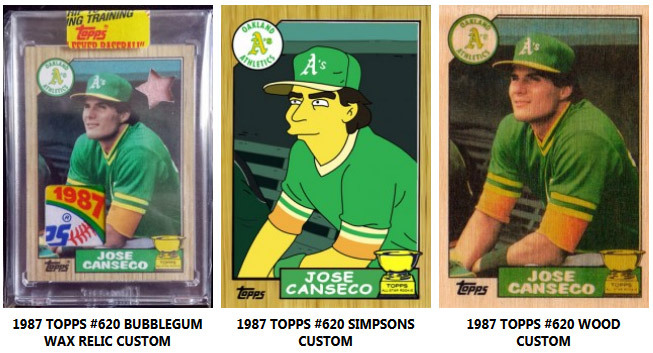 That the first pack-pulled bash brothers Topps cards in A’s jerseys were in this. The Bo Jackson Future Stars card, the 75 pound version of Barry Bonds rookie card … the list goes on. We reminisced about the funny nicknames like Walt “Three Blind” Weiss (though not in 1987 Topps) and Sid “Coffee and” Bream. My son pulled a Barry Bonds, my wife pulled a Mark McGwire, I pulled a Bo Jackson and my mom pulled THE Jose Canseco – she is the one shielding herself from being in a picture in the bottom right corner 🙂 My dad? He pulled nothing. This is par for the course for him, as he has never really had much luck with wax. 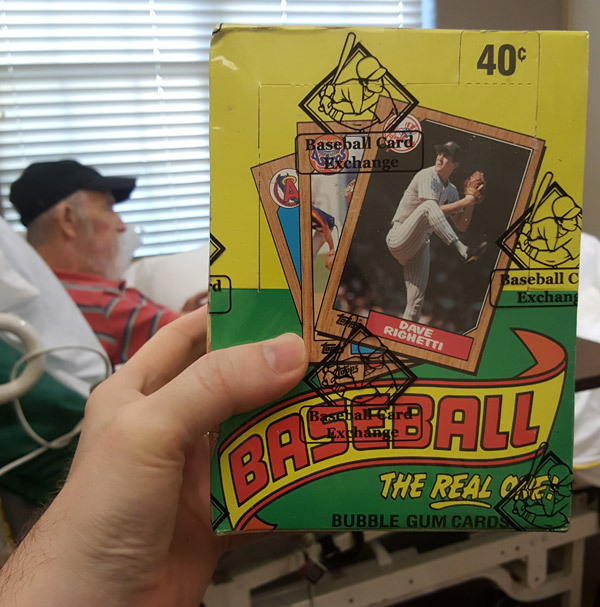 He talked about the time 30 years ago when we were at a shop and he spent $7 on a pack of 1987 Fleer, only to get nothing. The dealer opened one and got a good card. Dad paid $7 for another … and still got nothing. I literally just talked about that very instance a few weeks ago, but was amazed that he remembered. In the end, we were left with a bunch of great wood bordered cards. Many were off center, but it sure did make for a memorable evening. 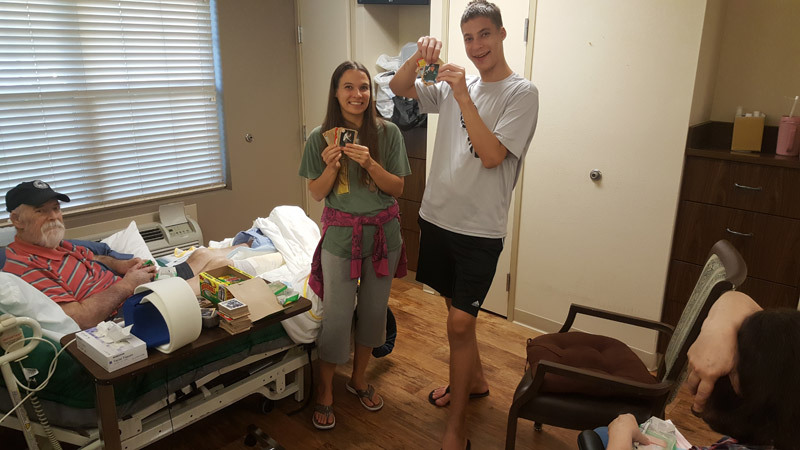 We all had a great bonding time together, and there were smiles all around – all because of a box of 1987 Topps. Great story. I’m following your posts on how your dad is doing. It’s great to see that y’all were able to do something cool like that together. My dad and I have few shared interests. What you did for your Dad (and always do, for that matter!) was awesome! I know he was thrilled and it did take his mind off his many problems for a while. Thanks for all you do for your folks.